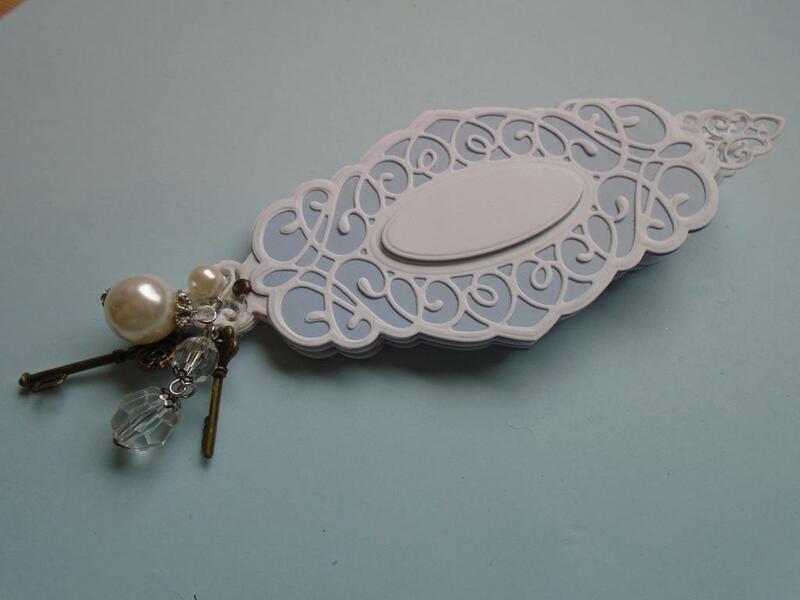 This project will show you how to make this Wedgewood inspired delicate fan using the Sue Wilson Tags & Frames Molly & Lauren Die. 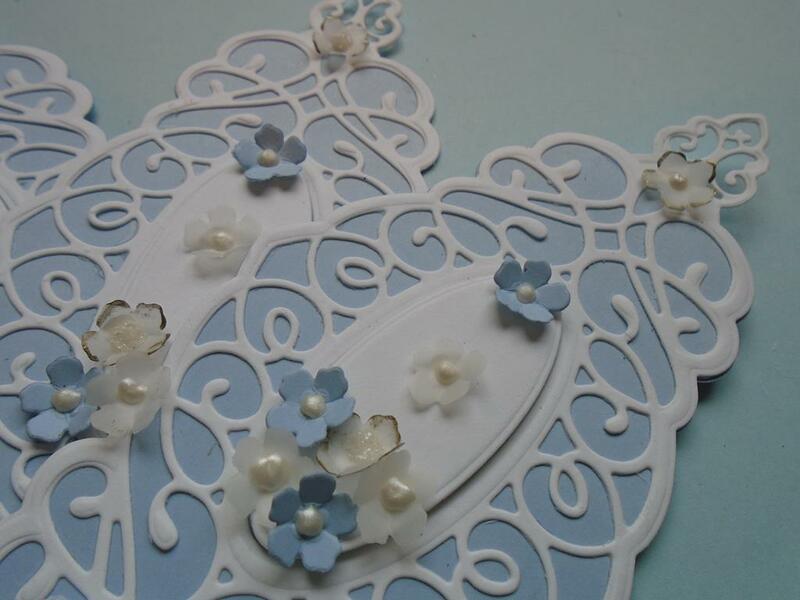 The flowers are created using the Sue Wilson Delicate Garden Frame Die. 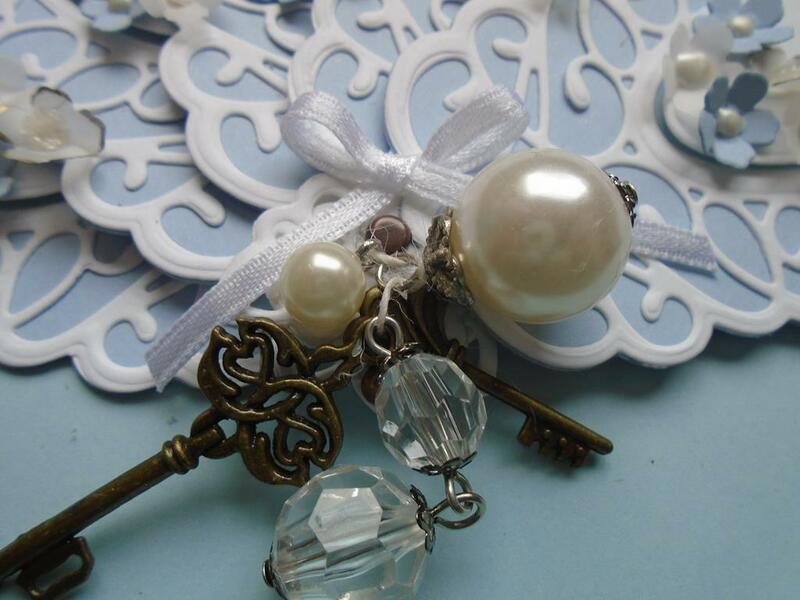 The whole piece is finished off with the Creative Expressions key charm embellishments & the Tim Holtz pearls. Step 1. 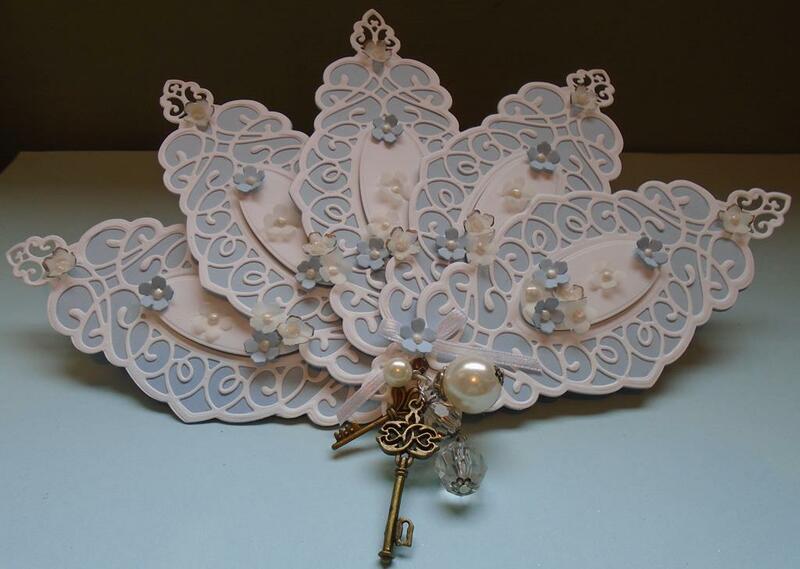 This workshop will show you how to make this delicate fan using the Sue Wilson`s tags & frames collection Molly and Lauren die sets. 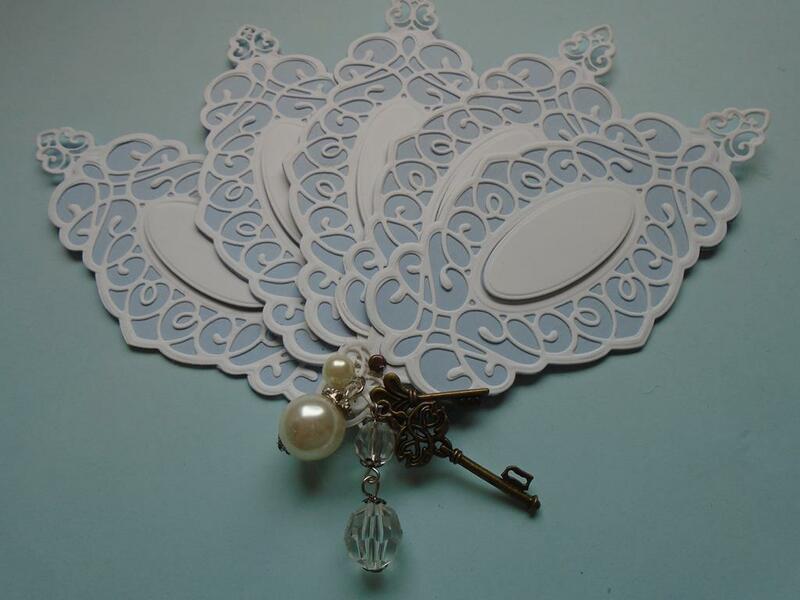 The small flowers are cut from the Sue Wilson delicate garden frame die set and the main die shapes will be used to create the fan shape and then embellished with the Creative Expressions key charms and the Tim Holtz Idea-ology baubles . Step 2. 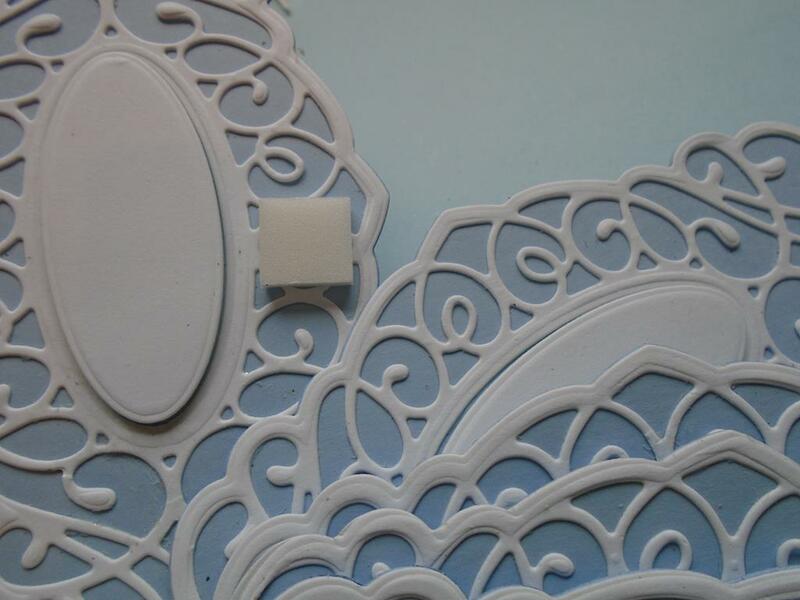 Take a piece of Foundations coconut card and attach the 3 outer dies from the Sue Wilson Molly die set and then on a separate piece of card place the 2 outer dies from the small tag on the Sue Wilson Lauren die set. 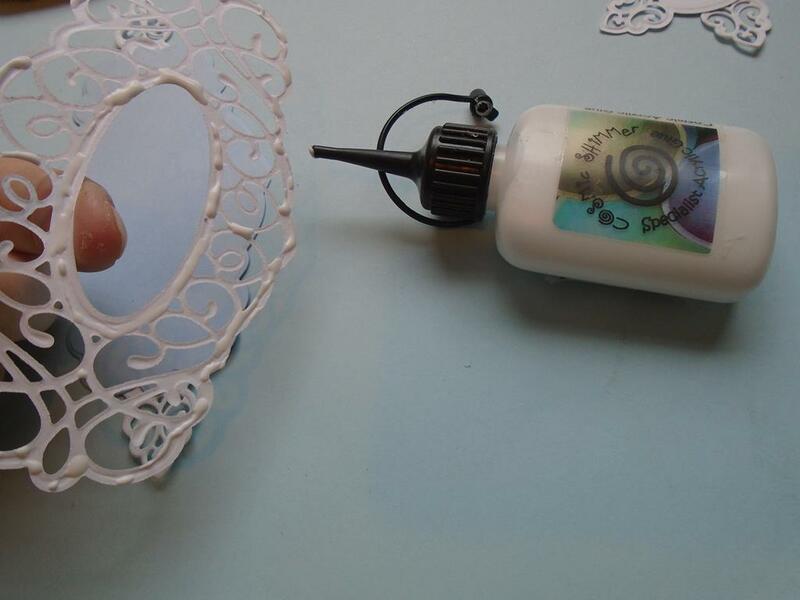 Fold a width of vellum into 4 layers and then secure the smaller flower die from the Sue Wilson delicate garden frame onto the vellum using some low tack tape. 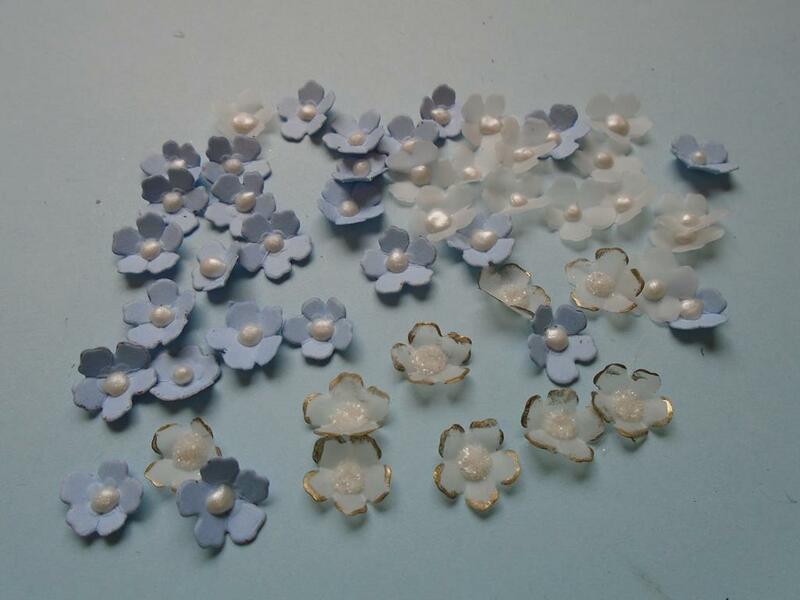 Also cut some of the small flowers in the baby blue card stock. Step 3. 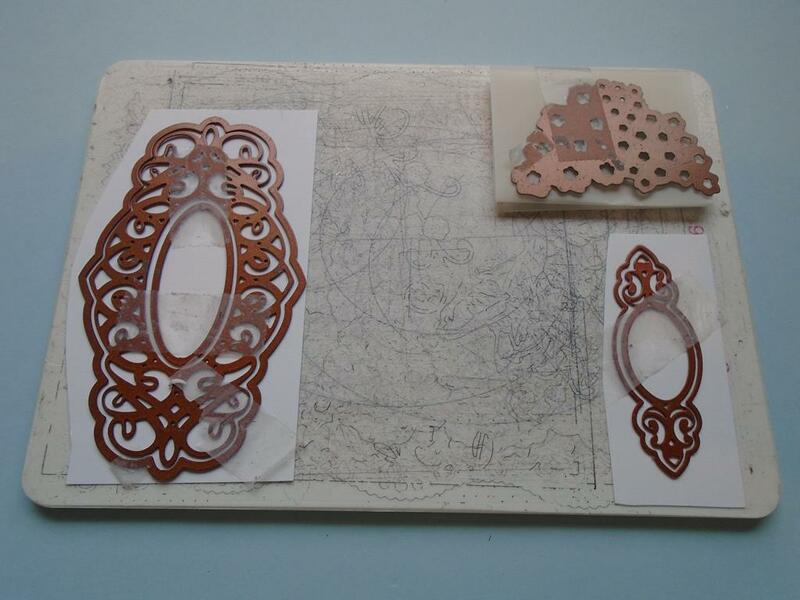 Pass the prepared pieces through the Grand Calibur and then emboss the piece using the usual pink plate, tan mat & base plate sandwich. 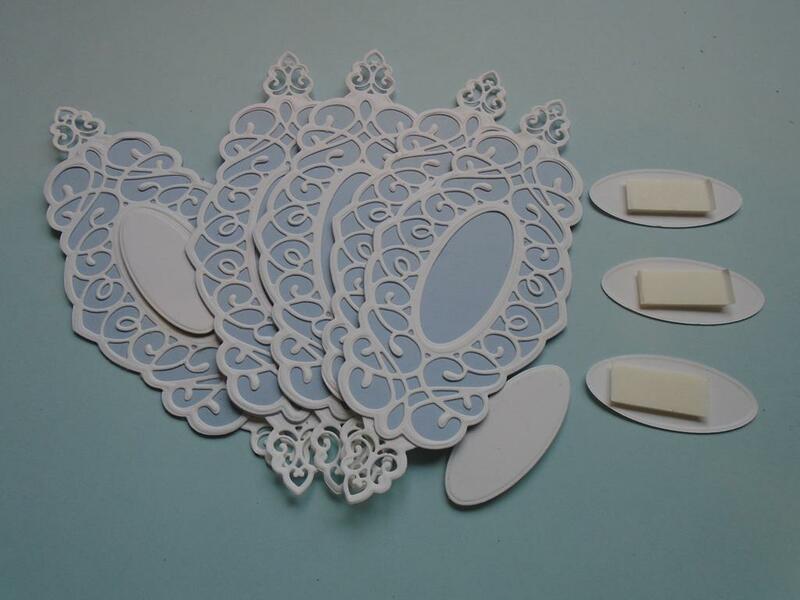 You will be left with the delicate Molly frame with an oval which will have been cut out to be used separately and then the small Lauren tag and all the vellum flowers pieces. Step 4. Cut & emboss the last few steps until you have 5 frames and tags. Step 5. 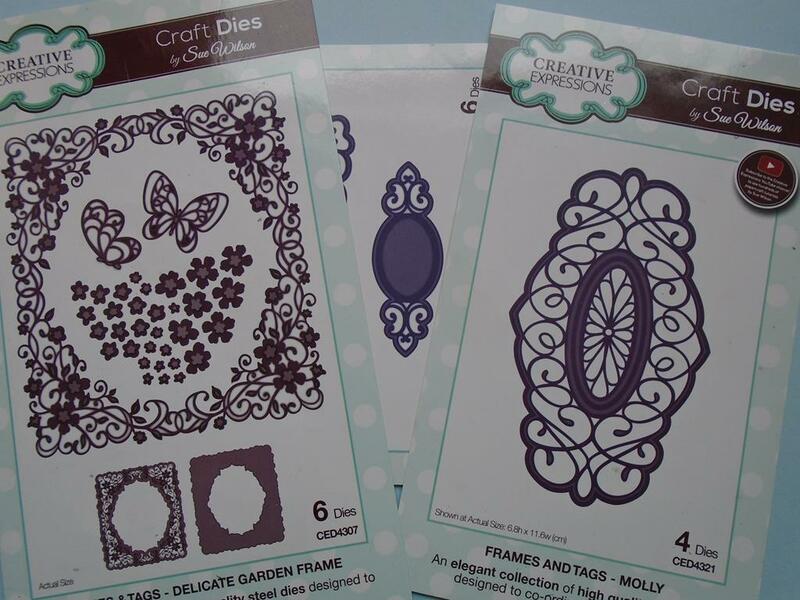 Now go back in and use the solid die from the Sue Wilson Molly die set and cut 5 solid pieces and another 5 frames in the same baby blue card or use a slightly darker card. Step 6. Trim the small Lauren tag in half across the centre of the solid middle area. Step 8. 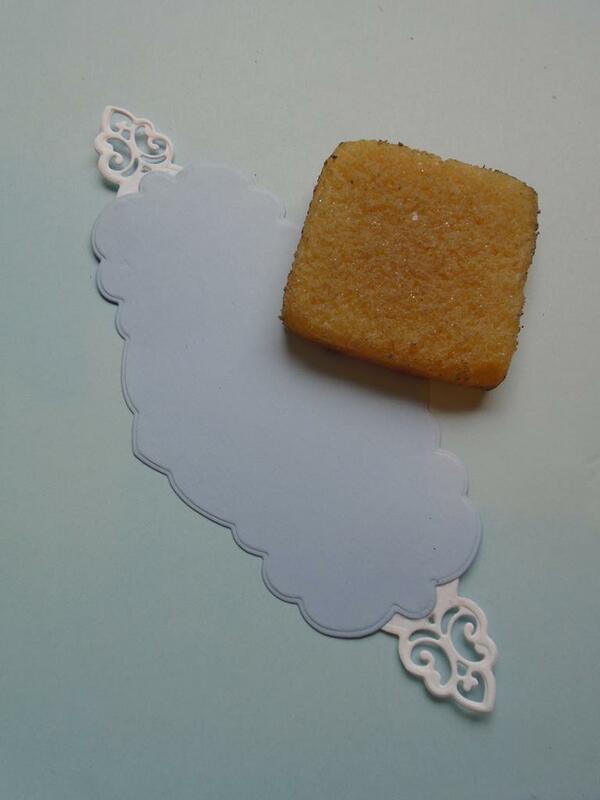 ……and then add it to the back of the lighter baby blue card frame. 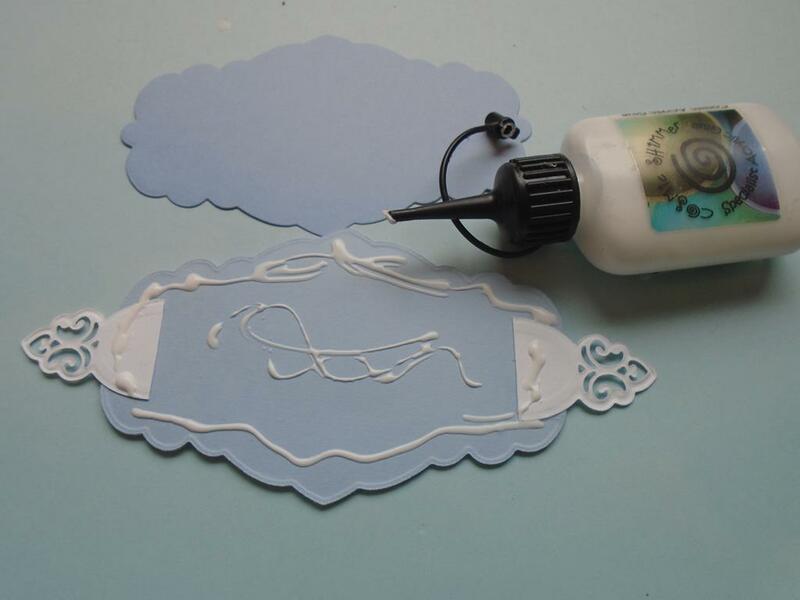 Use the adhesive remover eraser to get any sticky that the low tack tape can leave behind. Step 9. 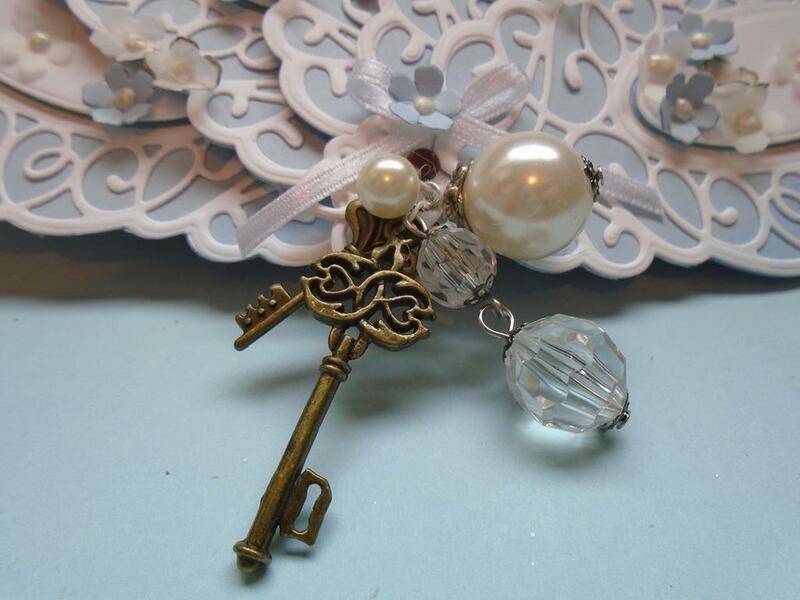 Add some of the Cosmic Shimmer dries clear glue on the reverse of the delicate Molly frame. Step 10. 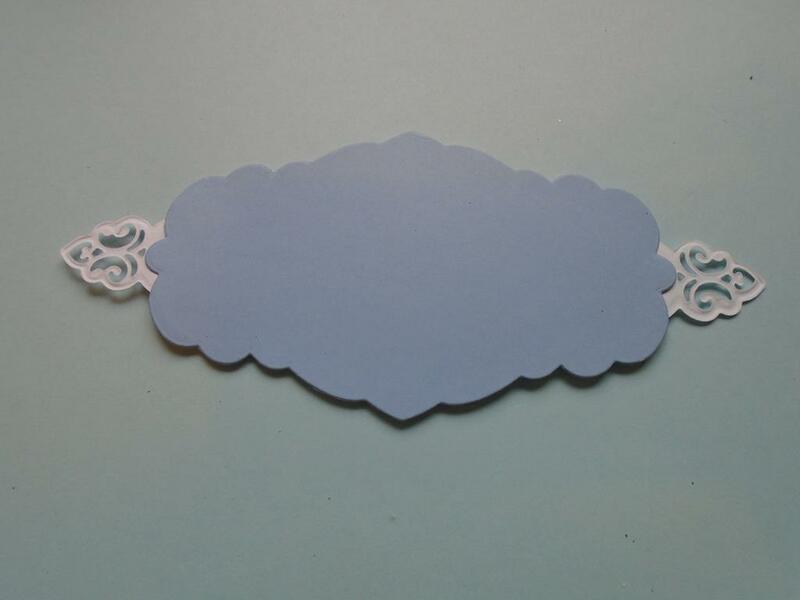 Place this frame onto the top of the solid blue frame making sure the tags is still on the reverse of this blue card as it will be covered next. Step 11. 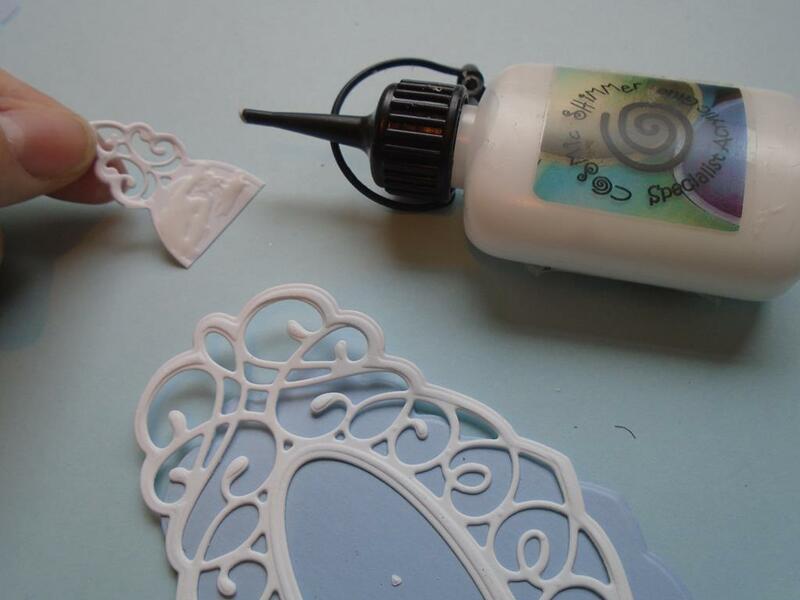 Add a small amount of the Cosmic Shimmer dries clear glue on the reverse of the solid worked piece area only. Step 12. Now attach the darker solid frame over the panel to cover up the cut tag area and this will also strengthen the piece too. Step 13. 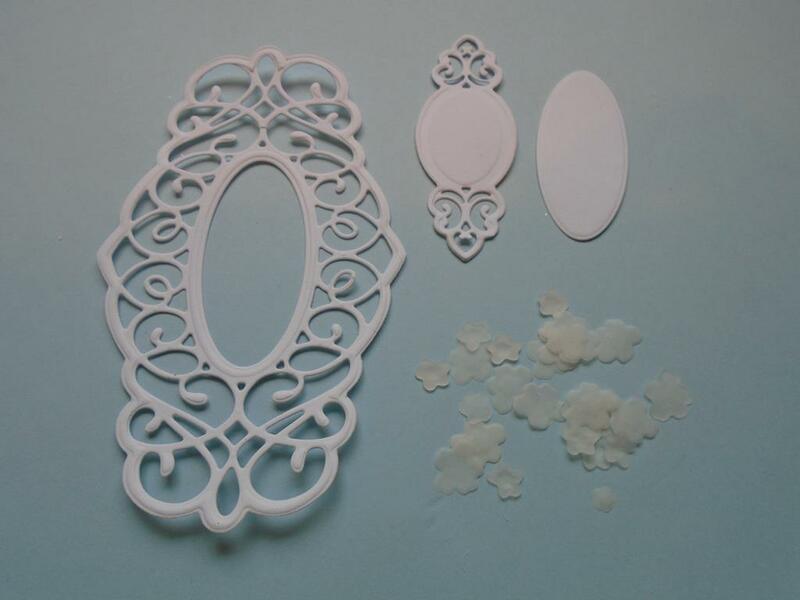 Repeat this until you have all 5 of the frames completed and then add a foam pad on the reverse of the small oval shapes. Step 14. 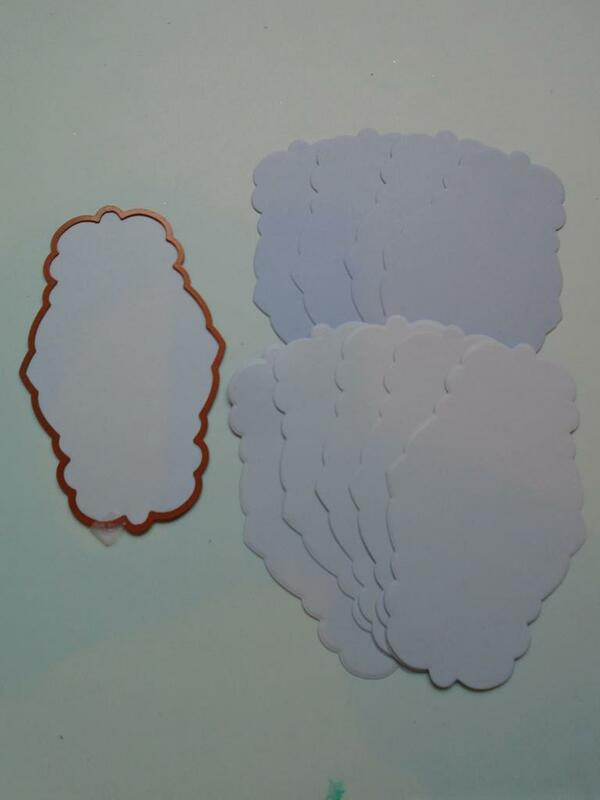 Gather all the die cut prepared pieces so they stack up and then add small brad through the small hole that is already in the tag end shape. Step 15. Bend the ends of the brad back to make all the frames gathered together. Step 16. 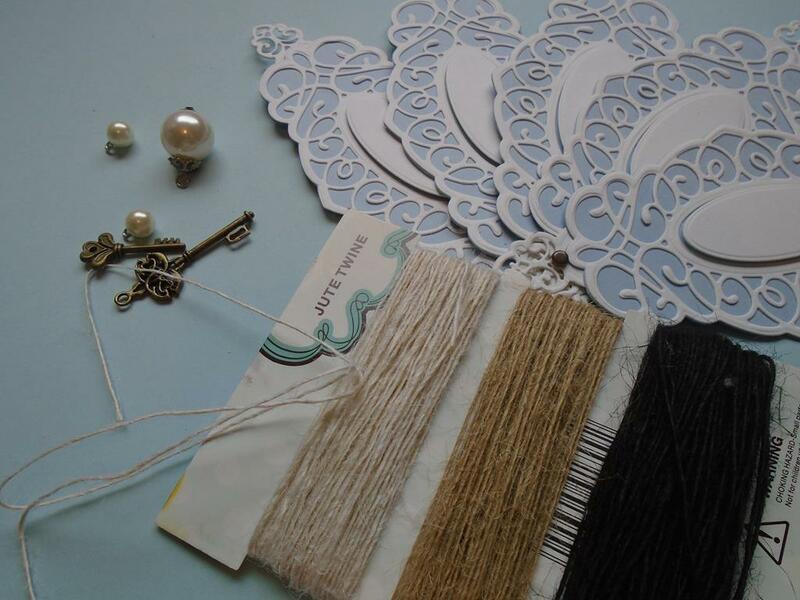 Cut a length of the light Creative Expressions Jute Twine and select 3 of the Tim Holtz Idea-ology baubles pearls with small eyes on them along with 2 Creative Expressions key embellishments you might have in your crafty stash. Step 17. 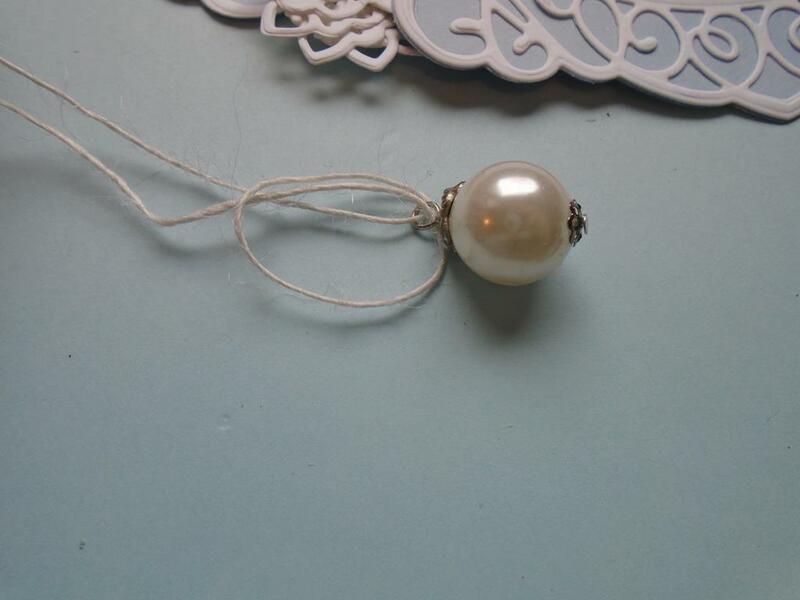 Pass a folded piece of the twine through the eye of the pearl & then pass the ends back through the loop. Step 18. 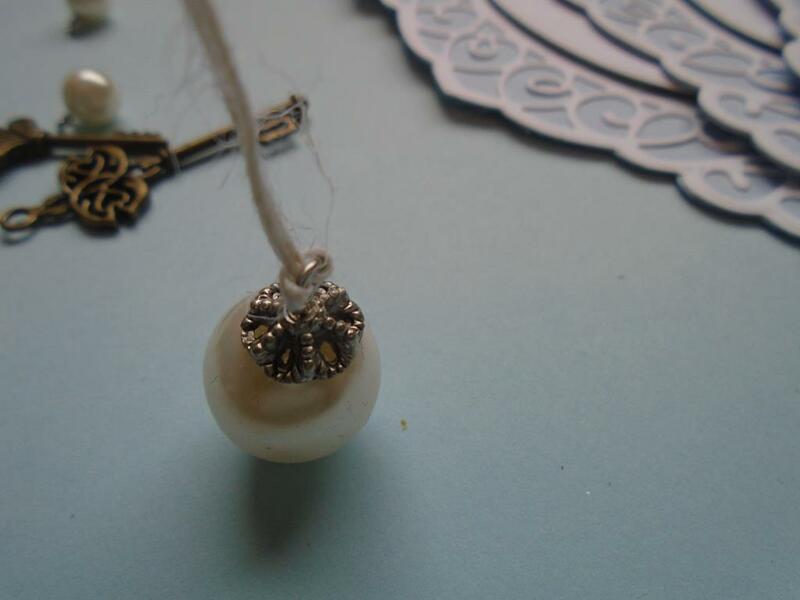 Pull the twine up to have the pearl secured on the piece of twine. Step 19. 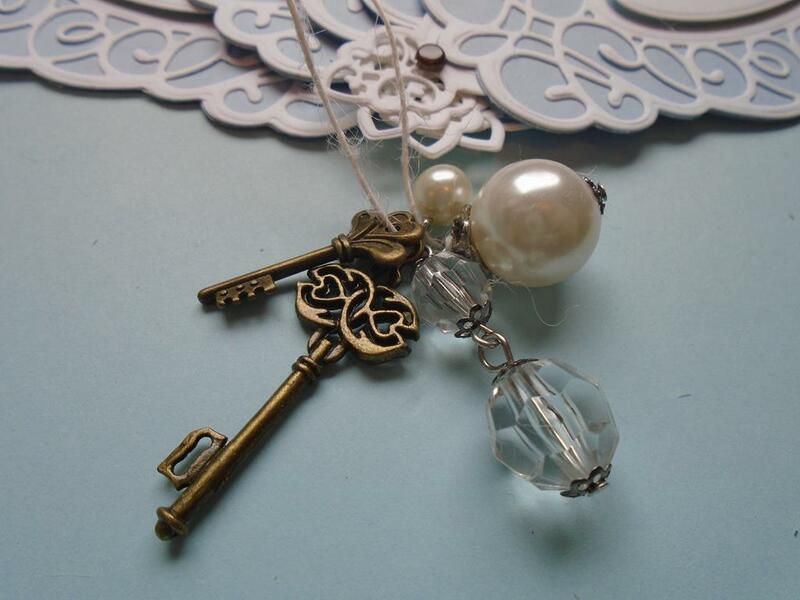 Thread 2 crystal drops which have been attached to each other and then add the other 2 pearls and the 2 keys onto the twine. Play about to see which way the embellishments lay best for you. Step 20. Take each end of the twine and thread it through each side below the brad. 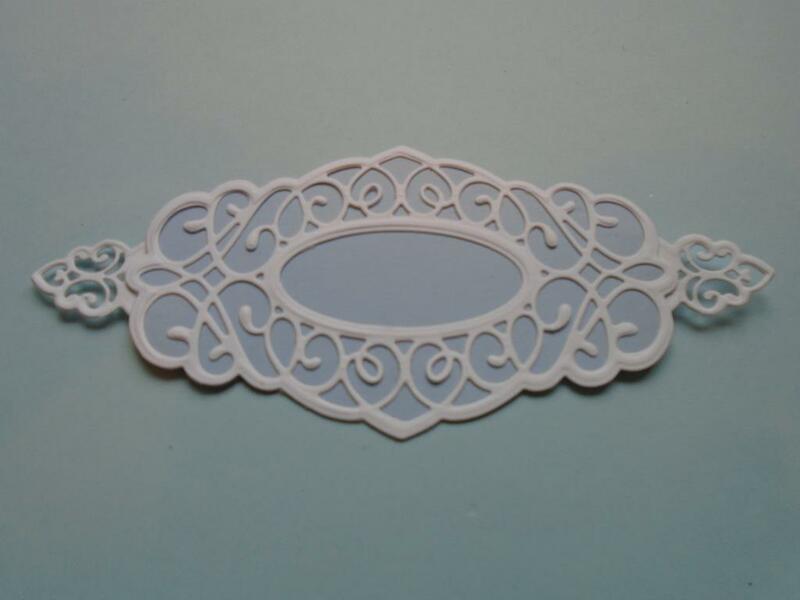 The style of die cut is perfect for this as no holes are needed to be made for this project. Step 21. 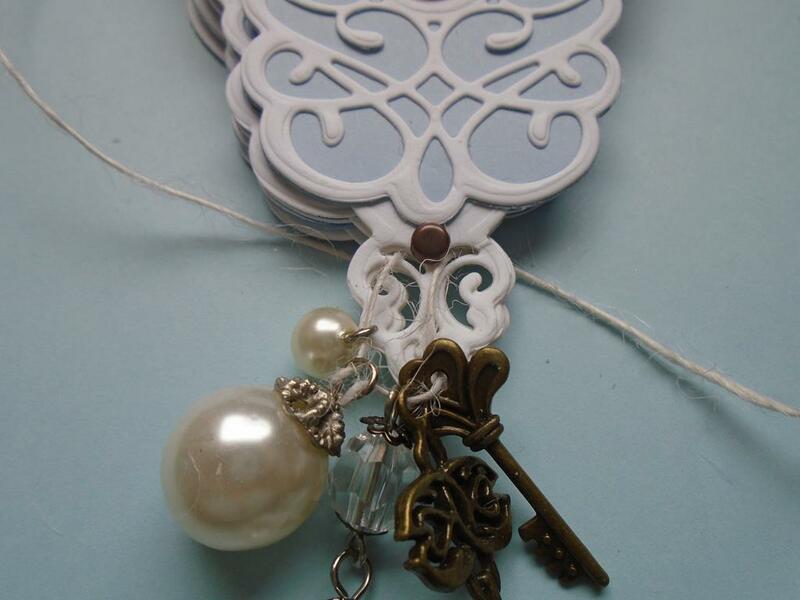 Leave a small length of the twine dangling so that the charms drop down below the intricate die shapes and then tie 2 or 3 reef knots on the back of the fan before trimming off the excess twine for a neat finish. Step 22. 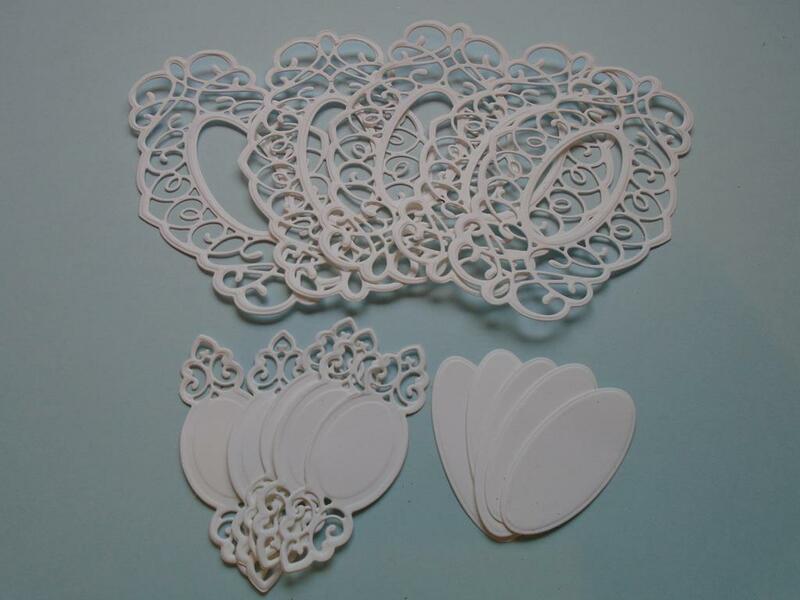 Place the cut out flowers onto the reverse of the cut`n`dry foam pad or use the stamping mat to roll the Spellbinders ball tool around the inside of the flowers as this will bring the petals up creating a lovely shape to the flower. Step 23. 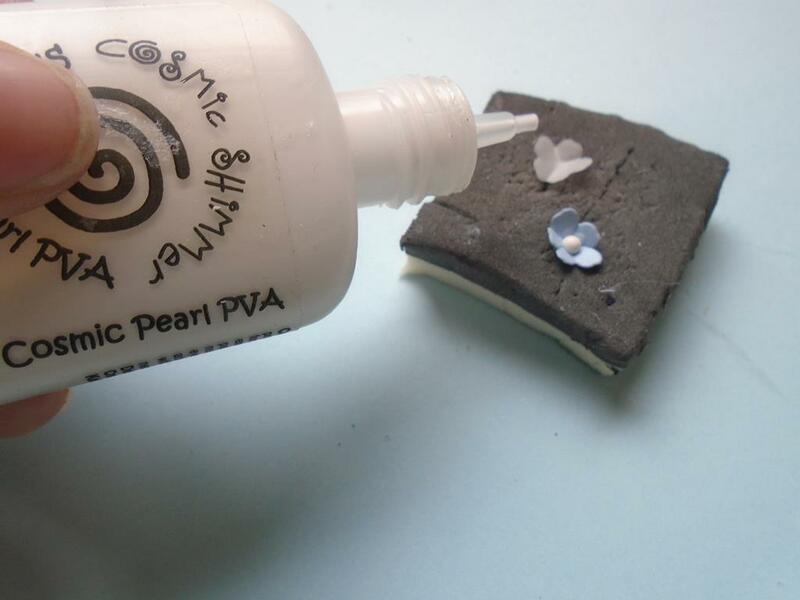 Add a drop of the Cosmic Shimmer pearl PVA glue in the centre of the flowers and allow the glue to set before adding the flowers to the project. Step 24. 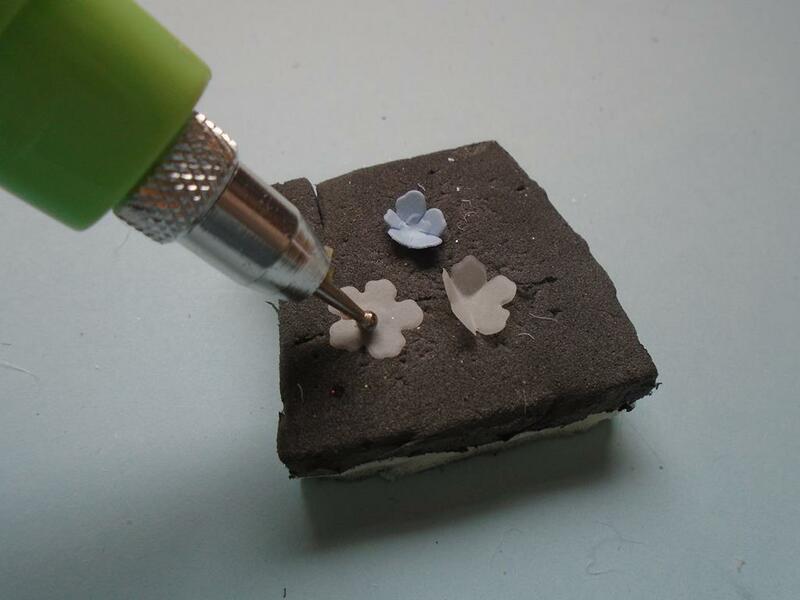 Add the ranger gold dabber on a few of the edges of the vellum flowers and the rock candy has been added to the centre of these flowers. Step 25. 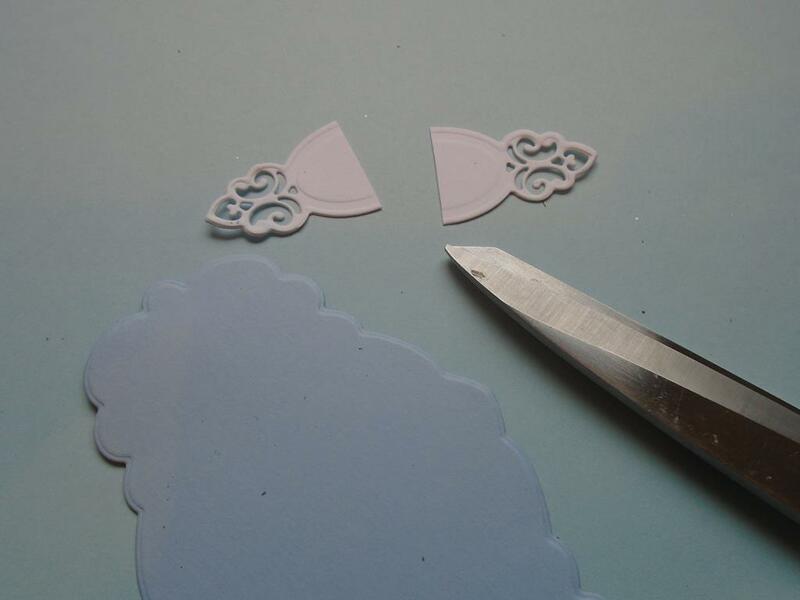 The finished project can be left so each blade closes up on itself . Step 26. 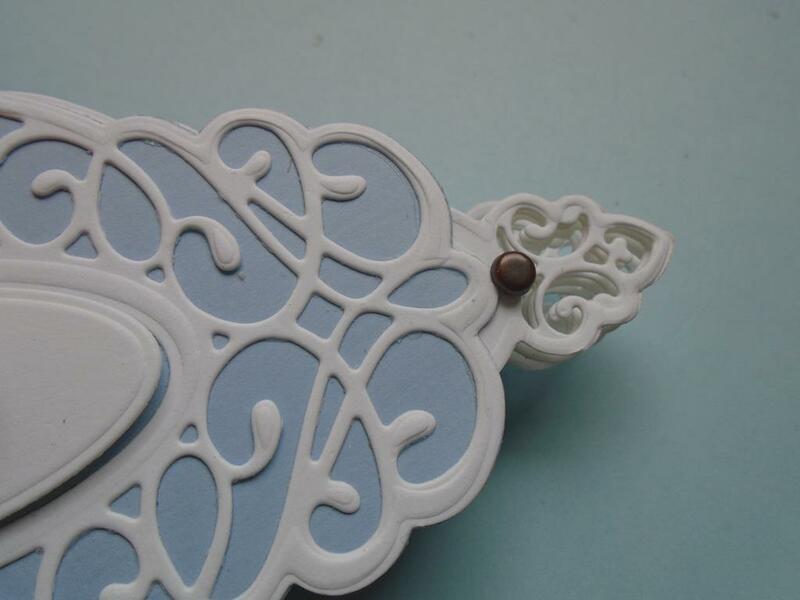 Then you can fan it open as and when you require it, but for a more decorated feel to the piece it`s nice to have it stuck open. Step 28. Then place the next blade so it overlaps onto the foam pad and continue until all of the blades are stick in place. Step 29. 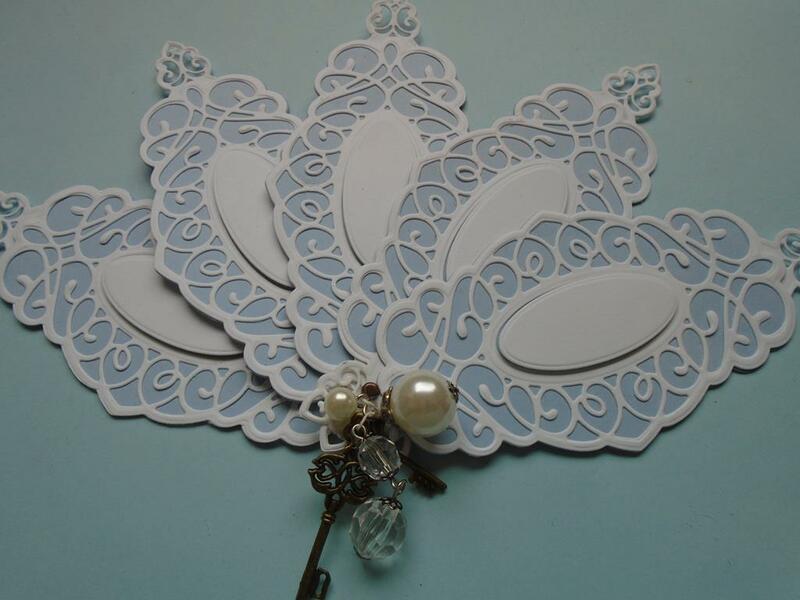 Add the small pearl centre flowers onto the fan to decorate it as you wish. Build up the flowers adding slightly more on the 1st right hand blade. 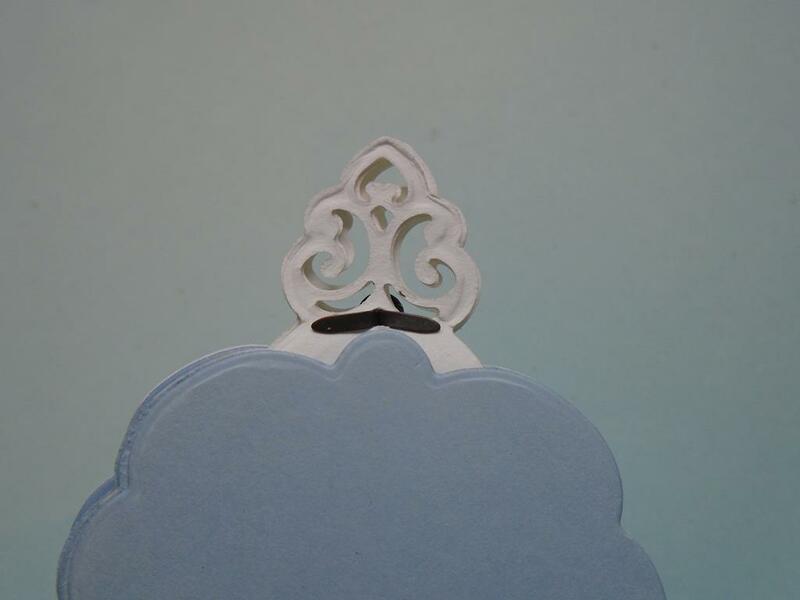 A gold edged flower is added to the end of the blade to bring in the colour from the key embellishments. Step 30. Attach a small white satin bow just above the brad. Step 31. Now add a small flower over the knot of the bow. Step 32. Here is the completed project which could have a nice matching box made to compliment the fan. 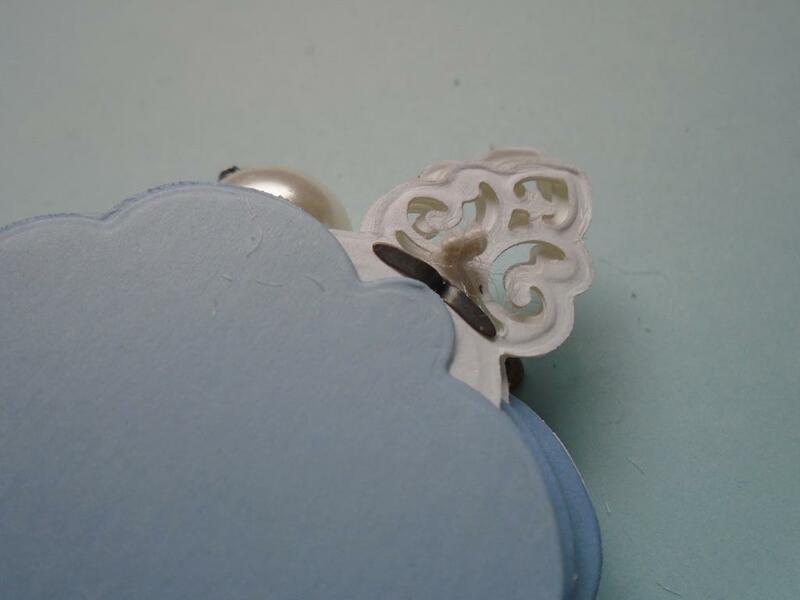 There is a sunken shaker box workshop on the Creative Expressions weekly workshop blog which is done in the same colours but it will need to be sized to fit the fan. Step 33. Just another different view of the fan. This means you will have the workshop e-mail straight to your inbox when it`s released at 00.30am on a Friday morning. 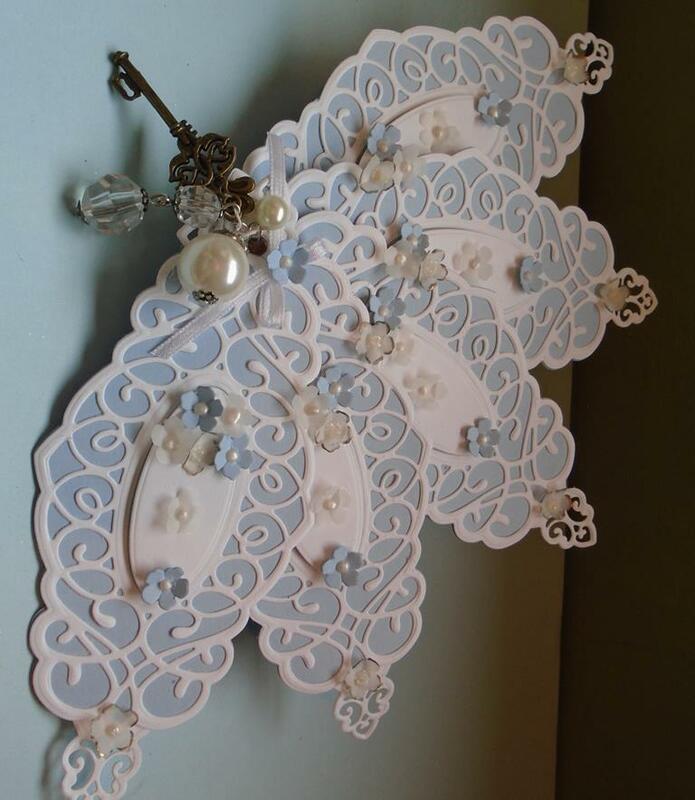 This entry was posted in Spellbinder Dies, Tim Holtz Distress Inks, Tim Holtz Idea-ology Range. Bookmark the permalink.